+$Whether you're building large-scale ecommerce websites for clients or simply need a home for your design portfolio, choosing the right hosting is essential. These days the most likely choice you'll have to make is between cloud and shared hosting, but what's the difference? +$We're used to seeing the word 'cloud' stuck in front of practically every technological term out there. And while most of us now have a decent grasp of what 'the cloud' is, the same can't be said for all its potential applications. +$Cloud hosting, for example, is not simply shared hosting with a cloud badge stuck on. Cloud hosting has certain unique features and advantages that put it in a league of its own when compared to more traditional forms of shared hosting. This article will explore the difference that set it apart. +$The critical differentiator of cloud hosting services is that they draw computing power from a pool of dynamically allocated resources across a large network of physical components, not a fixed set of hardware. 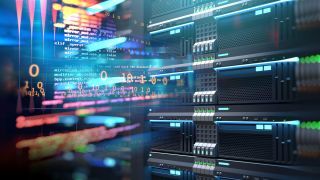 +$This might not be an issue for sites and applications with minimal requirements or low visitor numbers, but when it comes to running intensive, business-critical processes, many users find that shared hosting isn't quiteup to the job.